> Are Aboriginal league and footy players "too talented"? 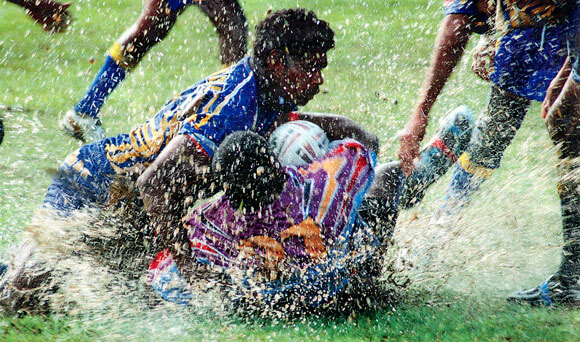 Aboriginal players show exceptional natural talent for rugby league, often being the only thing they are proud of. Among all this talent, however, recruiters started calculating players' risks and vulnerabilities. Aboriginal people seem to have a natural talent to excel in Rugby League. In the National Rugby League 11% of the players were of Indigenous heritage. In 2008 Australia's national Rugby League team saw a record number of five Aboriginal players (38%) in their ranks of 13. While they account for only about 2.3% of Australia's population (2008 figures), Aboriginal people account for more than five times that percentage of elite footballers . "It's like they have radars... they know where the footy is coming from, they know every angle of every ball and every kick needed for any goal," enthuses Kevin Sheedy, an AFL veteran and coach of the Greater Western Sydney Giants, about their talents . "Aboriginal footballers have added plenty of excitement and a degree of unpredictability and 'X' factor to the performances of our club," admits Kris Grant, CEO of the South Australian Bulldogs . "I can see a time when there may be as many as 25% of a playing group at a club being Indigenous," predicts Peter Rohde, General Manager of Football Operations at Port Adelaide  "You'd expect the numbers to increase and every team now seems to have a number of Indigenous players." "The speed and flair of Aboriginal footballers, coupled with their skills and creativity, make them perfect for the game," Rohde says. The Western Australian Noongar nation has been labelled "the most dominant cultural force in the history of Australian rules football" because so many talented players are Noongar. There were two Aboriginal coaches at the AFL's senior coaching level, both also Noongars: Graham “Polly” Farmer and Barry Cable. Australian rules football has a special place in the culture of many Aboriginal communities. In some instances it has become as much as 'an obsession' and a tool to keep children in school and promote healthy lifestyle messages . Australian Football League (AFL) is loved 'with a passion' from the Tiwi Islands in the north to the game's spiritual home in Melbourne in the south . It is loved for being an inclusive game that does not discriminate. Football gives Aboriginal people the acceptance and recognition they are longing for. In many communities the 'footy' plays a crucial role in keeping people together, giving them a sense of community and belonging, offering them an opportunity to meet and exchange news while they cheer the team on  — very similar to traditional times when large Aboriginal groups met if seasonal food was in plentiful supply. In this way every football game is an avenue to health and well-being for each individual. Rugby league was only introduced to Australia in late 1907 and yet there is strong evidence that it was first played in Cherbourg in 1908, which would make this small South Burnett Aboriginal mission one of the key birthplaces of Australian rugby league . Elcho Island (Northern Territory) has Australia's highest per capita participation rate in AFL football . The largest Aboriginal population lives in the western suburbs of Sydney, the traditional heartland of rugby league . In 2008 Liam Jurrah was playing footy barefoot in the dust of Yuendumu, a community about 300km north-west of Alice Springs, NT. Jurrah' selection in 2011 in the AFL was beyond what anybody thought was possible from a small, remote desert community. Living out in the bush, AFL may as well be "people playing footy on the moon" . Jurrah's native tongue, the Warlpiri language, is spoken by only 500 people. He has become a symbol of hope for many Aboriginal people of what is possible. Are Aboriginal players a 'risk'? Aboriginal players are often praised for their 'magic' or 'x-factor'  but there is another aspect to them. Team managers frequently attach a "stigma of risk and vulnerability" to key aspects of their cultural identity . Research  into AFL player recruitment found that clubs continued to see Aboriginal players as presenting particular "risks and vulnerabilities". Clubs calculate risks based on—among others—what suburb or area Aboriginal players come from, what schools they attend, their family status—good, bad, broken. It seems AFL clubs overemphasise the danger of Aboriginal players making 'mistakes', e.g. for drink driving or brawling, a risk which is equally present for non-Aboriginal players. Some such views may be based on thinking Aboriginal players are lacking dedication, and other racist attitudes. With so much talent among Aboriginal rugby players it seems only natural to have an Indigenous All Star team. Browse selected Aboriginal Australian Football League (AFL) statistics, facts & surveys.